How about a savory breakfast with a tangy twist? Bursting with flavor and fragrant, our morning meal was delightful. With surplus raw mangoes at home, its been an overload of tangy goodness this past week. 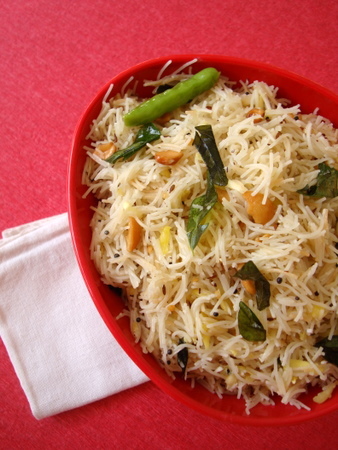 Mamidikaya (raw mango) Vermicelli Upma is quick and simple to prepare with few ingredients. For more spice increase the quantity of green chilies. 1 Boil 4 cups of water and add the vermicelli along with 1/2 tsp salt and 1 tsp oil. Once the vermicelli is cooked (it should be just soft and not mushy), turn off heat, pour the vermicelli into a colander to drain completely and pour cold water over it and keep aside. 2 Heat oil and ghee in a cooking vessel, add the mustard seeds and let them splutter. Add the black gram, cinnamon stick, cashew nuts and curry leaves and saute till the dal and nuts turn slightly red and a nice aroma emanates the kitchen. 3 Add the green chilies and ginger and saute for few secs. 4 Add the grated raw mango and saute on medium heat for 3-4 mts. Add salt to taste (remember you have already added salt to the boiling vermicelli, so add accordingly). 5 Now, add the cooked semiya to the sauteed mango base and mix it lightly and see that no lumps form. Adjust salt. 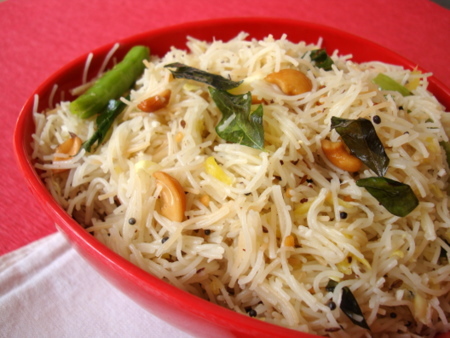 For variation, garnish with grated coconut. Can you please post some other recipes to use raw mangoes? That’s one interesting way to use raw mangoes. Done with various chutneys and panna and kairi dal, I was itching for something new to try. This sounds delish! Nice and lovely twist to regular mango rice! Delicious and mouthwatering semiya upma..
wow looks tempting and delicious ……..
You can use grated carrot or mixed vegetables (saute them well). Tasty twist with a raw mango to the regular breakfast. love samiya any way! nice twist of mango! This is one of my fav dish and I can never make it nice. In fact my hubby makes it perfect .. just like yours. Next time I will ask him to add raw mangoes and I can already say i will like it. Nice twist! Sorry, quick question, when you refer to green chilies are they the spicy peppers? Also what is black gram? Yes, spicy peppers. Use to suit your spice level. Black gram is a lentil that is used in South Indian seasoning. It goes by the name Urad dal/Split Gram Dal. Check out a picture of the dal here. I made this Upma for my kids and they loved it.Thanks a lot. Omit baking powder and use 3/4 tsp baking soda. Waiting for new recipes from you..
I’ve been checking the site regularly to see updates from you. Is everything going on ok? Tried this! Came out perfect! Looks delish…. I use raw mangoes and coconut with rice. think. why didn’t u add pasupu . recipe will be more colourful. Thanks for sharing such an amazing post. This dish was yum to taste. it just made my made after cooking this and surprising my husband.